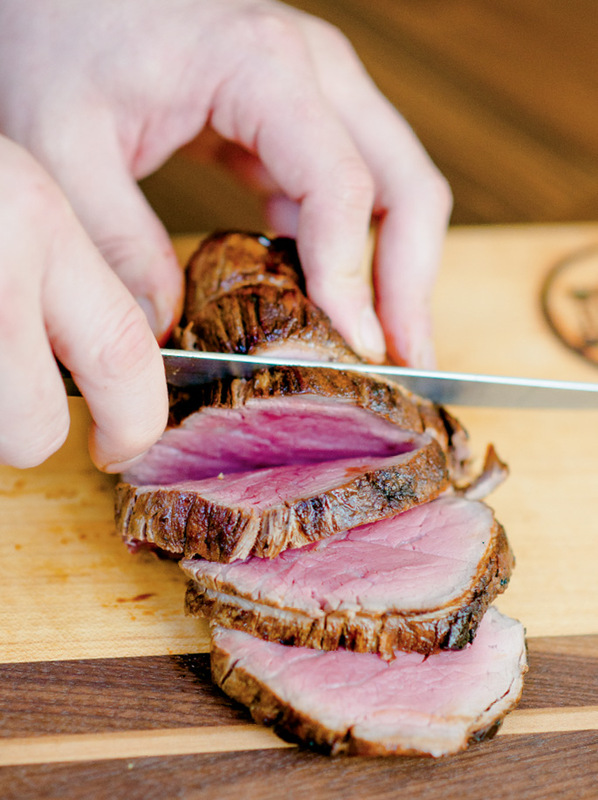 Prime Cut: Using indentations from the butcher’s twine as a guide makes slicing the châteaubriand a snap. 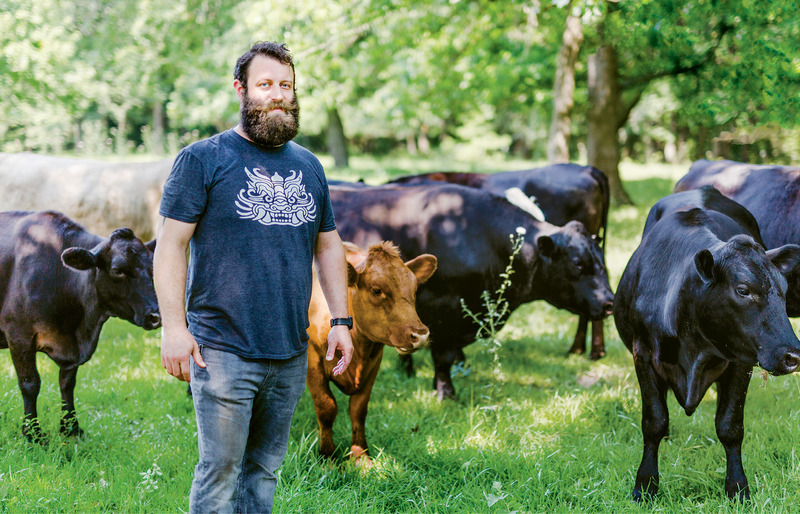 As the chef de cuisine of Cypress restaurant and its meat-centric sidekick, Artisan Meat Share, Bob Cook is the man to seek out when you want beef on the menu. Tops in the fields of butchery and whole-animal utilization, he was the perfect candidate to take on three different cuts and cooking methods that make steer the star of the show. First up: a luxury cut simply prepared. While named for a favorite recipe of French politician François-René de Châteaubriand, the châteaubriand, in butcher-speak, is a two- or three-person portion from the “head,” or widest part, of a beef tenderloin. 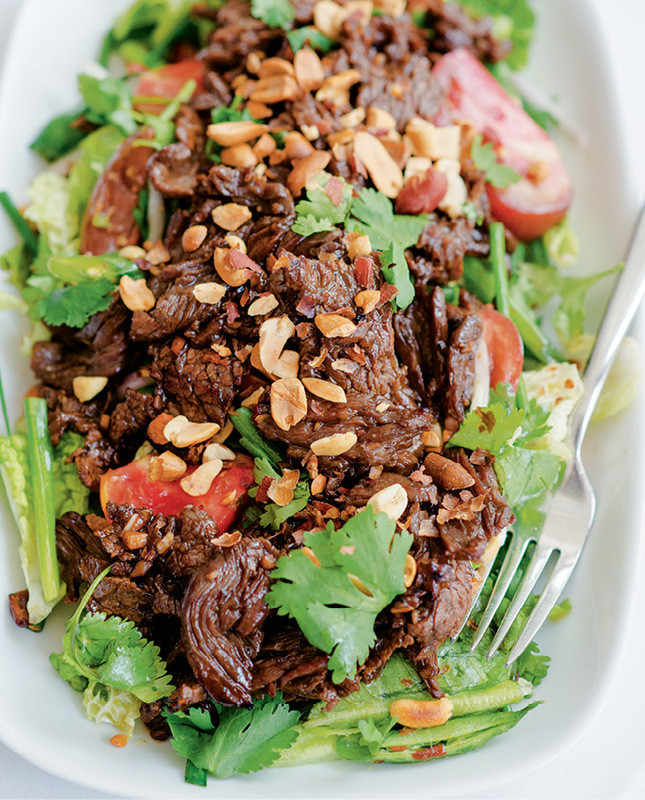 “It’s extremely tender with a melt-in-your-mouth feel,” says Cook, “but lacks the flavor of a fat-marbled cut.” He selects a straightforward high-temp roast for his version, brushing the beef with a captivating combo of local honey, fish sauce, and roasted garlic oil designed to tease out its taste. 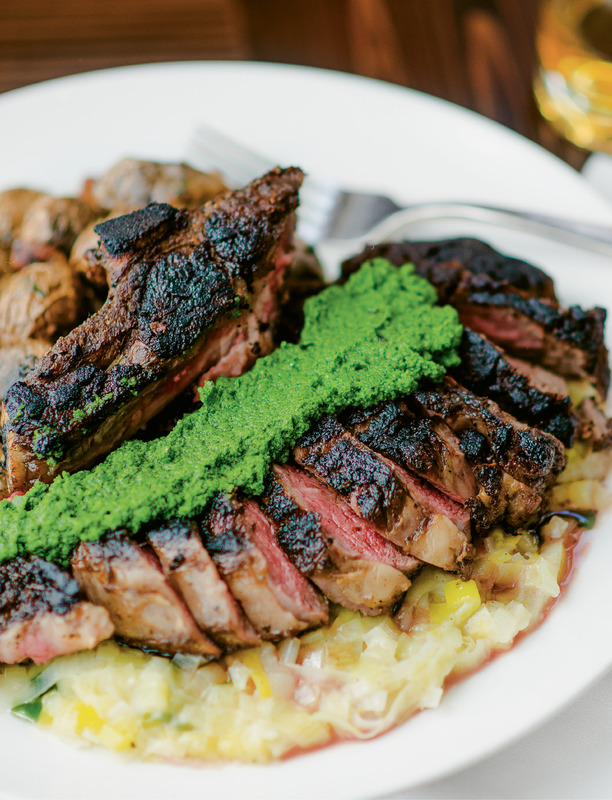 Pivoting to a full-fledged dinner dish, Cook heads outside to the grill with “Burnt and Salty” rib-eye steaks and a hobo pack of fingerling potatoes. “The rib eye,” he explains, “has the most inter-muscular fat content because of the animal’s limited daily use of that muscle. It’s a tender cut of meat with a rich flavor profile.” Salsa verde adds a bracing acidity; leeks and roasted garlic pump up the potatoes. And if grass-fed beef is your pleasure, cuts from Annie and Marc Filion’s Angus and Charlais cattle can be purchased at their Keegan-Filion Farm in Walterboro, through their CSA, and at the Summerville and Port Royal farmers markets. While you’re at it, you might want to bring home some of their pastured poultry and pork; Cypress and Artisan Meat Share are two of their biggest customers for those products.